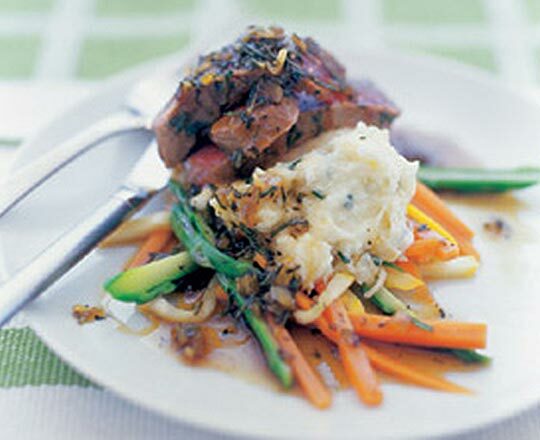 Delicious minty lamb with a super creamy mash! Boil the potato and parsnip until tender, drain and mash well. Stir in the Philly*, chives and seasonings and milk if necessary. Keep warm. Combine the rosemary, garlic and oil. Rub half of the mix over the back straps. Chargrill the lamb until the required doneness. Remove and wrap in foil to rest. Add the remaining rub to the pan and cook gently for 1 minute, pour in the stock and mint jelly simmer 5 minutes or until reduced by a third. Carve the lamb in thick diagonal slices and place onto mash on the service plates. Drizzle with the sauce and serve immediately with steamed greens.